While they consort with Russians. Imagine that. Meanwhile, my check from Gazprom has yet to arrive. Still. The fracking industry and their supporters have accused the Frack Free Dentongrassroots organization that is seeking a ban on fracking in the Denton city limits of receiving money from Russia. If you heard a woman’s mAnIciAL laughter this morning I confess it was mine. I’ve been too busy with local Texas issues lately to focus deeply on the happenings in Europe. This morning a friend pointed out that any sanctions the U.S. places on Russia will likely have an effect on U.S. oil companies consorting with Russia. Exxon and Shell won’t like it if President Obama messes up their consorting. For more information on U.S. fracking industry consorting in Russia, see the U.S. Energy Information Administration. 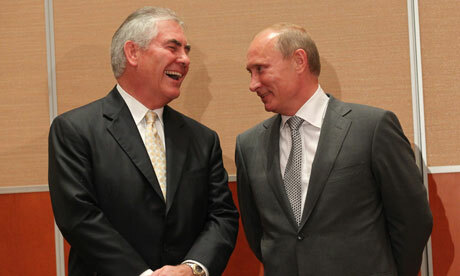 Exxon CEO and fracking NIMBY Rex Tillerson shares a joke with Russian leader, Vlad the Impaler. Vladimir Putin meets with Chevron management. Halliburton, BP and Russian Black Gold – a history BP and Halliburton involvement in Russia. Picture: Royal Dutch Shell CEO Ben van Beurden Bows to Putin. Caption: For over a 100 years, Shell has been driven by unscrupulous greed as its sole motivator. Shell funded Hitler and the Nazis party and has subsequently done business with a string of evil regimes, including General Sani Abacha, Gaddafi, Saddam Hussein and the Mad Mullahs of Iran. Putin is but the latest power mad egomaniac to be treated like royalty by Shell. Bowed to and fawned over on Good Friday by the overpaid bootlicker, Ben van Beurden. VLADIMIR PUTIN: Mr Mulva, I am very pleased to see you again, this time in Russia. As far as I know, your business is developing successfully. You cooperate with many of our major oil and gas companies. I would like to see relations between Russian and American business develop more dynamically, especially in such a strategic sphere, as energy. I have been told that you are involved in investment and have certain plans in this direction. I would like to express my hopes that this area of your work will be as successful as everything that you have done so far. JIM MULVA: Mr President, allow me to thank you for those very warm words. I would like to say that we are working very energetically to invest considerable sums in the energy dialogue. We have conducted huge work since our last meeting, which I think took place nine months ago. I would like to say that this work is very intense, and we are creating a very good investment climate with your help and support. We hope that this will allow us to make long-term investments in the Russian economy. We will develop our work with major companies representing Russian business. 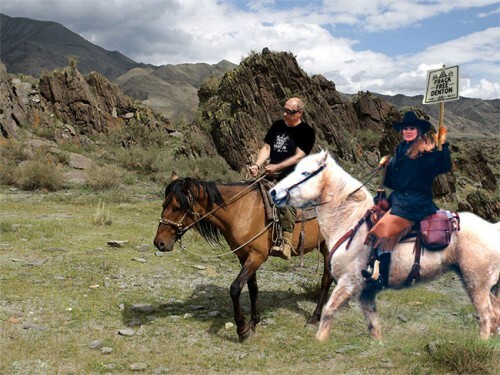 My name is Sharon Wilson and I enjoy spending a leisurely Sunday riding my horse with shirtless Russian leaders (shirtless version HERE) even when said leaders show poor horsemanship (get off that horse’s mouth fer crine out loud and, OMG, feed him something). 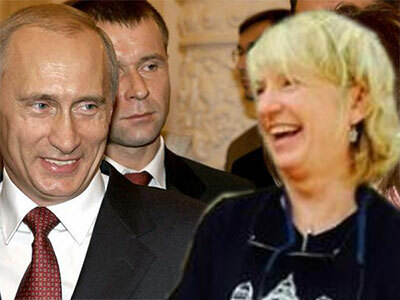 Other members of Frack Free Denton also enjoy spending time yucking it up with Russian leaders. I wonder what Mr Smitherman and all those industry hacks who made similar accusations when addressing the Denton City Council Tuesday will say about Exxon and Shell et. al. consorting with Russia. It will probably sound something like THIS.